oil and gas - Phillips Murrah P.C. Click image for source article. A new case filed in federal court in Colorado challenges the process of force pooling certain mineral owners and working interest owners. The suit, dated Jan. 22, names Gov. Jared Polis and Jeffrey Robbins, acting director of the commission, as defendants. It seeks to temporarily halt the process and challenges the constitutionality of the forced pooling provision of the Colorado Oil and Gas Act. The complaint, filed with U. S. District Court, challenges the statute on constitutional grounds, including arguments that the law violates mineral owners’ rights to contract, equal protection, freedom of association and due process, among others. The outcome could have a substantial impact on oil and gas operators in Colorado and beyond. Oil and gas companies will want to monitor this case moving forward and consider the potential impact it could have on their ongoing operations involving pooled acreage. Phillips Murrah law firm is proud to welcome Morgen D. Potts to our downtown Oklahoma City office. Phillips Murrah welcomed Morgen to the Firm’s Energy and Natural Resources Practice Group as an associate attorney. Morgen represents both privately-owned and public companies in a wide variety of oil and gas matters, with a strong emphasis on oil and gas title examination. Morgen has represented low-income families at the University of Oklahoma’s legal clinic, assisted a University professor with research to update a Real Property treatise, assisted with title work for a land acquisition company, and assisted on cases as an Associate Attorney at a general practice law firm located in Oklahoma. Before joining Phillips Murrah she had her own practice in Norman, Oklahoma where she practiced a variety of different types of law. Morgen graduated early from law school, was published in the Oil and Gas, Natural Resources, and Energy Journal for the University of Oklahoma, competed on an American Bar Association negotiation team, and earned an Academic Achievement award in her Mineral Title Examination class while attending law school. Morgen was raised in Moore, Oklahoma and is currently living in Oklahoma City with her husband. She enjoys reading, yoga, playing golf, and spending quality time with friends and family. 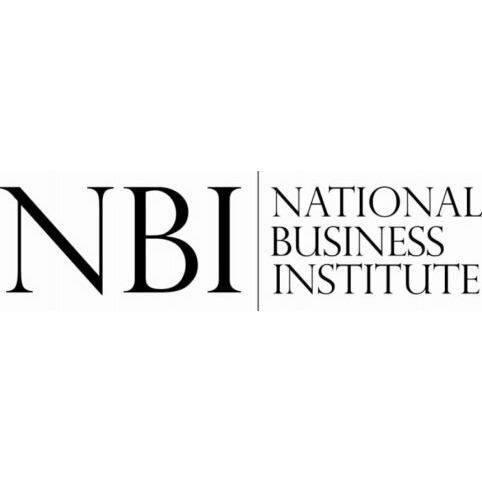 Directors Robert N. Sheets and Melissa R. Gardner will give presentations June 12 and 13, respectively, at the National Business Institute’s seminar “Title Law: A to Z” for Continuing Legal Education professionals on issues relating to title law. Sheets will present on endorsements and policy exclusions at 3:30 p.m. and 4 p.m., and Gardner will present on ethical considerations and quiet title actions at 2 p.m. and 3:15 p.m.
Those interested in registering can get more information at www.nbi-sems.com. Attendees receive CLE credit for participating. This article was published in OIPA Wellhead, a publication produced by Oklahoma Independent Petroleum Association and distributed to its membership. Liz Brown is a director at Phillips Murrah, P.C., where she has practiced for most of her legal career. Liz is primarily a tax and transactional lawyer with a special emphasis in the energy industry. Act now to preserve your estate. Low oil and gas prices create opportunity for estate tax planning. The current economic downturn in the oil and gas industry combined with the low interest rate environment and the availability of valuation discounting techniques creates a number of unique opportunities for tax planning. Two planning concepts used to save estate taxes that work especially well while oil and gas prices are low are the gifting or sale of equity interests in a family business to children or trusts created for their benefit. The following is a typical structure of this planning concept. The depressed value of oil and gas prices means business valuations are substantially lower than they were a year and a half ago. As a result, more assets can be given away to family members or trusts for the benefit of family members within the confines of the lifetime gift tax exclusion. All the while, the business owner can still maintain control over the business after the gifts. Currently, there is a $5,450,000 (or $10,900,000 for a husband and wife) estate and gift tax exemption available to shelter assets transferred during lifetime or at death from gift and estate tax. This means that a business owner and his/her spouse can transfer up to $10,900,000 in asset value (either during lifetime or at death) in the aggregate to any one or more family members or others with no gift or estate tax liability. The value of assets transferred during lifetime or at death in excess of $5,450,000 (or $10,900,000 for a couple) is generally subject to estate tax on the death of the survivor of the business owner and his/her spouse. If the business owner and his/her spouse have a net worth that exceeds $10,900,000, other planning techniques, such as gifting, can substantially reduce any potential estate tax liability. 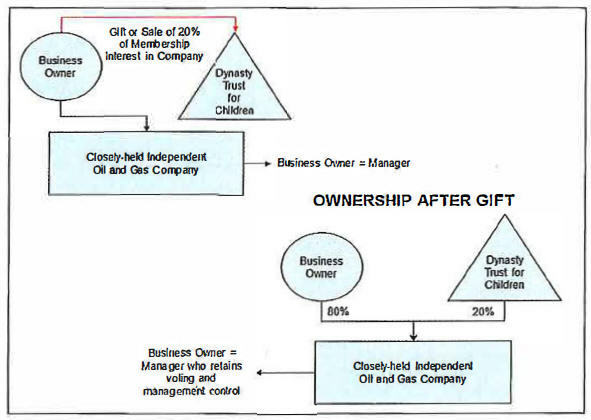 By the gifting or sale of interests in an independent oil and gas company, the value of the interest transferred is in effect “frozen” as of the date of the gift so that future appreciation in the value of the gifted interest is excluded from the business owner’s estate for estate tax purposes. Gifts of equity interests in the oil and gas company made in trust instead of outright to the business owner’s children have other advantages as well. For example, if the business owner makes a gift of equity interests in the oil and gas company to a “granter trust,” the business owner will continue to be treated as the owner of the gifted interests after the gift for income tax purposes (but not for estate tax purposes). As a result, the business owner will continue to pay the income tax on the income generated by the gifted equity interest in the oil and gas company. By doing so, the income tax attributable to the gifted interests paid by the business owner (instead of by the trust or the children) is, in effect, an additional gift from the business owner to the business owner’s children that is not taxable for gift tax purposes. Additionally, assets gifted to multi-generational trusts can pass to younger generations free of gift or estate tax. Finally, gifts of equity interests in the oil and gas company made to a trust are protected from the claims of both the business owner’s creditors and the children’s creditors. The benefit of gifting interests in an oil and gas company while oil and gas prices are down is illustrated by this example. If a 1 percent interest in an oil and gas company was worth $50,000 when oil prices were at $100 per barrel, a gift of a 20 percent interest in the oil and gas company would be worth $1,000,000 and would reduce the business owner’s unified estate and gift tax exemption by $1,000,000 ($50,000 x 20), leaving an exemption of $4,450,000 to shelter future estate or gift tax liability. If that same 1 percent interest in the oil and gas company is now valued at $15,000 with oil prices at a little over $30 per barrel, then the value of a gift of a 20 percent interest in the oil and gas company would be only $300,000 ($15,000 x 20) and would reduce the business owner’s gift tax exemption by only $300,000, leaving an exemption of $5,150,000 to shelter future estate or gift tax liability. Any future appreciation in the value of the gifted or sold interest in the oil and gas company now valued at $300,000 would escape taxation in the business owner’s estate. So, if next year, oil prices go back to $100 per barrel, the 20 percent interest in the oil and gas company would have appreciated by $700,000. That appreciation would escape taxation in the business owner’s estate. In that event, the gift or sale of a minority interest in the oil and gas company made while prices are hovering around $30 per barrel would result in an overall tax savings of approximately $277,200 ($700,000 x the maximum estate tax rate of 39.6%). As the value of the gifted interests increases over time, the tax savings would be even greater. The result of lower oil and gas prices is that greater quantities of oil and gas assets can be transferred out of the business owner’s estate and sheltered from tax, given the current depressed state of the energy industry. This can be particularly helpful long-range when the inevitable turnaround in the energy industry does occur. In addition to future increases in oil prices, other foreseeable factors very well may adversely impact these planning techniques in the near future, including increases in interest rates and the anticipated change in the tax law limiting the use of discounting techniques. The Federal Reserve has made it known that it intends to increase interest rates periodically throughout the year and the IRS has been considering issuing proposed regulations to limit the use of discounts for lack of marketability and lack of control in determining the value of gifts of equity interests in a closely held business. The low interest rate environment, along with lower business valuations, make oil and gas company and other estate tax planning techniques work especially well at this point in time. If you are concerned about the partial impact of estate taxes on your oil and gas business, now is a great time to plan – before the recovery in oil and gas prices, the inevitable increase in interest rates, and the possible elimination of discounting techniques. 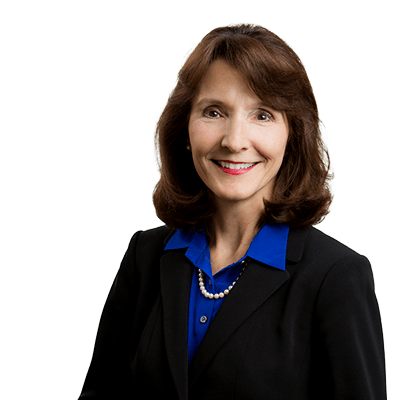 Elizabeth K Brown is an attorney and Director of Phillips Murrah P.C, a member of the OIPA board of directors and CEO of The Gloria Corporation, an oil and natural gas exploration and production company. 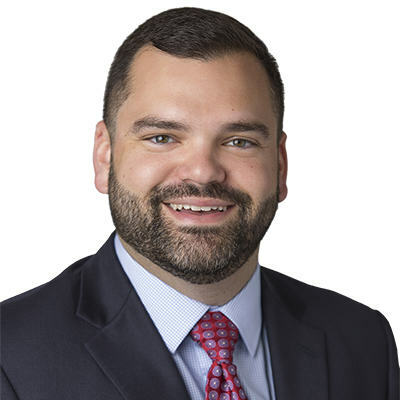 Mike McDonald, of Triad Energy in Oklahoma City, has served as chairman of the OIPA and president of the Domestic Energy Producers Alliance, and holds a Juris doctor the University of Mississippi and a master of laws degree from New York University. Tim Kline represents clients mainly in bankruptcy and creditor rights matters and is a frequent lecturer on bankruptcy-related topics. Phillips Murrah Director Tim Kline will be addressing the topic of restructuring at this year’s Oklahoma Society of CPAs Oil & Gas Conference on Aug. 20. The all-day conference will be held at the Sheraton Reed Center, located at 5800 Will Rogers Road in Midwest City. The conference is worth eight hours of recommended CPE credit. The 2015 conference will top off your tank with 13 sessions in today’s most significant oil and gas developments. Sessions include: property and severance taxes, earthquakes and fracking; oil and gas acquisition; cyber threats; and more. Tim’s panel will be help from 11:15 a.m. – 12:30 p.m. Session objectives: Learn when to retain restructuring advisors; understand the costs and benefits associated with filing in the most commonly chosen venues; understand chapter 11 from a debtor’s perspective from a secured creditor’s perspective; understand the roles played by secured and unsecured creditors’ committees; and learn how you can assist the debtor and the committees throughout a chapter 11 business reorganization. Also, learn more about Tim’s life and career in this Executive Q&A featured recently in The Oklahoman. For those of us who lived in Oklahoma during the 1980s, it may feel a little like deja vu all over again. While the Oklahoma economy is more diversified than it was in the 1980s, our State’s overall well-being is still tied heavily to the health of the oil and gas industry. As a whole, our industry is much stronger and more financially sound than it was in the 1980s. But, if oil prices remain where they are now, or drop lower, difficult times may be ahead for all Oklahomans, but especially for energy producers and service companies. Those of us who are concerned about the potential impact of this recent downturn and want to take steps to minimize any resulting financial hardship should take a serious look at asset protection planning. Asset protection planning typically incorporates a wide range of techniques accepted under Oklahoma and bankruptcy law to shield assets from the claims of creditors. The key to a solid asset protection plan is to establish the plan before a financial crisis is on the horizon, since transfers made with the intent to hinder, delay or defraud creditors or when the transferor is insolvent can be attacked and possibly invalidated. One of the asset protection planning tools available under Oklahoma law is the Family Wealth Preservation Trust, created under the Oklahoma Family Wealth Preservation Trust Act passed in 2004. This unique but little known Oklahoma law permits a person to transfer Oklahoma assets to a revocable “Preservation Trust” and protect those assets from claims of that person’s creditors. The Trust Agreement must provide that the income produced by its assets is subject to Oklahoma income tax. Until last year, there was a $1 million cap on contributions to a Preservation Trust. Effective Nov. 1, 2014, however, the Oklahoma legislature lifted the cap so that the Act now exempts all trust assets held in a Preservation Trust from attachment or execution to satisfy a judgment against the Grantor. This recent amendment eliminating the cap makes the Preservation Trust a much more attractive asset protection planning tool since now all assets in a Preservation Trust, regardless of value, are protected from claims of the Grantor’s creditors. The most unique feature of the Preservation Trust is that the trust agreement can provide that the Preservation Trust can be revoked or amended by the Grantor at any time. This power of revocation or amendment allows the Grantor to retain ultimate control over the assets transferred to the Preservation Trust. Until the Act was passed, Oklahoma law did not allow a Grantor of a trust to set up a revocable trust and protect the assets in trust from the claims of the Grantor’s creditors. As a result, creditors could easily reach assets held in a revocable trust to satisfy their claims against the Grantor. Now, however, as long as the assets are held in the Preservation Trust, those assets are not subject to the claims of the Grantor’s creditors even though the Grantor has the power to revoke the Preservation Trust at any time. Many energy companies that are owned and operated by Oklahoma producers are “Oklahoma-based companies” and thus suitable assets for transfer to a Preservation Trust. An Oklahoma-based company is a corporation, limited liability company, limited partnership, limited liability partnership or other legal entity formed or qualified to do business in Oklahoma that has its principal place of business in Oklahoma. The most problematic part of the Act seems to be the requirement that an Oklahoma bank or trust company serve as trustee or co-trustee of the Preservation Trust, since the fees of the corporate trustee increase the associated costs. 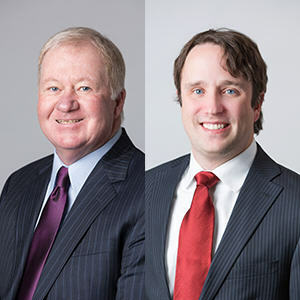 A typical asset protection plan for an Oklahoma oil and gas producer could, for example, involve the Grantor setting up a Preservation Trust and transferring equity interests in the Grantor’s Oklahoma-based business to the Preservation Trust. Alternatively, the Grantor could set up a new limited liability company (“Newco”) funded with Oklahoma marketable securities or deposit accounts, then transfer a part or all of the membership interests in Newco to the Preservation Trust. By doing so, the Newco membership interest owned by the Preservation Trust would be protected from the claims of the Grantor’s creditors. If the Preservation Trust is set up in accordance with the Act (and subject to the provisions of the Uniform Fraudulent Transfer Act under which creditors, in certain instances, can attack asset transfers), any assets that are held in the Preservation Trust, including the stock or other equity interests in the Oklahoma based business, will not be subject to the claims of the Grantor’s creditors so long as a majority in value of the assets are Oklahoma assets. Even if the Preservation Trust owns some assets that are not Oklahoma assets, those assets also would still be protected as long as the majority in value of the assets in the Preservation Trust are Oklahoma assets. In our industry, we have certainly weathered economic storms before and no doubt we will weather this one as well. While we are all hopeful that oil prices will recover in the short term, none of us have a crystal ball. Therefore, it is smart to consider taking some defensive moves now, including developing an asset protection plan possibly with a Preservation Trust. If you set up a Preservation Trust and the worst-case scenario develops, the assets in the Preservation Trust will be protected from the claims of your creditors. On the other hand, if and when the skies clear and commodity prices rebound, you can simply revoke the Preservation Trust and go back to business as usual. Ask yourself…what do you have to lose? Elizabeth K. Brown is a shareholder in the law firm of Phillips Murrah, P.C. She is also CEO of The Gloria Corporation, an independent oil producer based out of Ada, and a member of the Board of Directors of the Oklahoma Independent Petroleum Association and the National Stripper Well Association. Mike McDonald, owner of Triad Energy in Oklahoma City, has served as chairman of the OIPA and president of the Domestic Energy Producers Alliance. He holds a juris doctor from the University of Mississippi and a master of laws degree from New York University. OKLAHOMA CITY – Scott M. Rayburn has joined Phillips Murrah’s Transactional Practice Group as an of counsel attorney. Rayburn’s practice will be focused on business transactions, entity formation and structure, and capital raising and formation. He will also be representing clients in negotiating and structuring acquisitions and divestitures, private equity financing, contractual matters and other issues faced in general business and corporate affairs. For 12 years prior to joining Phillips Murrah, Rayburn was General Counsel at Canaan Resources, an Oklahoma City based natural gas company. Phillips Murrah also added Sidney J. Earnheart to the firm’s Energy & Natural Resources team as an associate attorney. Earnheart represents both privately-owned and public companies in a wide variety of oil and gas matters, with a strong emphasis on oil and gas title examination. Prior to joining Phillips Murrah, Earnheart worked as an attorney in Houston, Texas for a law firm that specializes in matters related to oil and gas. Guest article originally published in The Journal Record on Oct. 24, 2014. Elizabeth K. Brown’s practice is focused at a strategic level on serving her clients as outside counsel where she assists privately held companies in managing the many legal issues that arise in running a business. A vibrant and growing oil and natural gas industry is paying dividends for Oklahoma, the most recent example being the increased payments to the state’s General Revenue Fund from taxes on the oil and natural gas industry. Gross collections to the General Revenue Fund increased during the third quarter, up by almost 10 percent from the previous year. A significant portion of that increase came from the state’s gross production tax on oil and natural gas production, which saw a 33.4-percent growth compared with the year before. The General Revenue Fund is the key indicator of state government’s fiscal status and the predominant funding source for the annual state budget. Collections, reported by the Office of Management and Enterprise Services, are revenues that remain for the appropriated state budget after rebates, refunds and mandatory apportionments. The growth of receipts from the state’s gross production tax is an important benchmark because Oklahoma’s oil and natural gas industry remains a critical component of the fiscal stability for both state and local governments. The Oklahoma Energy Resources Board’s May 2012 Oklahoma’s Oil and Natural Gas Industry Economic Impact and Jobs Report shows the industry, as a whole, accounts for approximately 25 percent of all taxes paid in the state. The greatest single benefactor of direct apportionments of gross production tax revenues is the state’s education system. Data from the most recent OERB report released in September shows the oil and natural gas industry accounted for more than $325 million to local school districts across the state. Another $150 million was allocated to the Oklahoma Student Aid Revolving Fund, the Higher Education Capital Fund and the Common Education Technology Fund. To put that in perspective, take the northern Oklahoma community of Alva. In the heart of the Mississippi Lime, the Class 2A school district received $3.7 million in state funding for the 2012-13 school year. Of that, $2.1 million came directly from the oil and natural gas industry. This state’s oil and natural gas industry is producing for Oklahoma. A growing oil and natural gas industry means increased funding for Oklahoma’s students and ensures future generations can continue producing for Oklahoma. 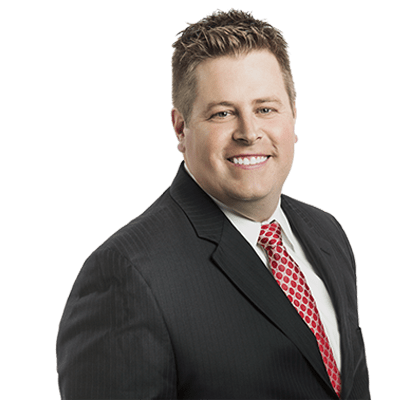 OKLAHOMA CITY – Zachary K. Bradt has joined Phillips Murrah’s Energy & Natural Resources team as an associate attorney. Bradt represents both privately-owned and public companies in a wide variety of oil and gas matters, with a strong emphasis on oil and gas title examination. Prior to joining Phillips Murrah, Bradt worked as an in-house title attorney for Chesapeake Energy.